WHY isn���t this a TV Drama? This is a really super book, and I was very sad when it came to an end. I���ve never met C. Michelle McCarty, but this book is written with such clear vision that at least part of it must be autobiographical, and I���d be willing to bet that the ���C��� in her first name stands for Cherie. 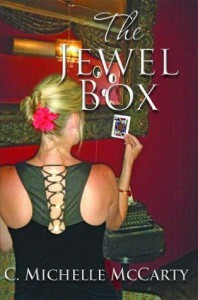 Regardless of whether this is autobiographical or complete fiction, there are some great books in the realist tradition, depicting contemporary social realities and the lives and everyday activities of ordinary people, and Jewel Box stands strong amongst them. Mark Twain, John Steinbeck, Jack London and Henry James (who argued that a text must first and foremost be realistic and contain a representation of life that is recognisable to its readers) were masters at the art, and I can assure you Michelle McCarty is not far behind, not least in that she actually has the courage to kill off her darlings at various stages throughout the story. Steinbeck is one of the few novelists to have the balls to kill his darlings when Tom Joad, hero of Grapes of Wrath, simply walked out of the book after killing Casey's attacker. Just like that, with about 10% to go, Steinbeck walks him out of the book. How brave is that? Well, I���ve no intention of placing spoilers in this review, but with McCarty you just never know what���s going to happen next. This is a love story that kicks off in a strip bar, and without a shadow of doubt my favourite character is the avuncular bar owner, Beau, with his rugged Clark Gable looks, fatherly advice and dexterity with a pack of cards. But the book is much more than a love story. It covers several decades and part of the joy of the story is McCarty���s references to popular music of the times which she skillfully weaves into the tale, including ���Sugar Sugar��� by The Archies, ���Fever��� by Peggy Lee, John Lennon���s ���Imagine,��� ���Mercy Mercy��� by Marvin Gaye, ���Raindrops keep Falling on my Head,��� ���La Grange��� by ZZ Top, ���Can you mend a Broken Heart��� by the Bee Gees, ���Yester-Me Yester-You Yesterday��� by Stevie Wonder and many more. This is a clever ploy for it takes the reader right back to the era so you���re no longer reading a story concerning something that happened in the past but you actually feel yourself living it. McCarty is an accomplished wordsmith and she uses these skills to draw the reader back in time with vision. Back in the 70���s you were defined by the music you listened to and the clothes you wore. You wouldn���t find a skinhead listening to King Crimson, or a Rocker listening to blue beat or reggae. You weren���t allowed. But Cherie���s tastes cross all divides listening to Tamla Motown, heavy rock, soul and even on occasion bubblegum pop. McCarty���s writing is graceful and exquisite, even when touching on raw subjects such as drug addiction and domestic violence. This is a love story with battle-scars, and even though I���m a bloke who doesn���t read many love stories I cannot wait to pick up the next offering by Michelle McCarty. Right now, I can���t imagine it topping this one, but there���s a feeling in my bones that there���s much, much more to come from this talented writer. Please somebody turn this into a TV drama.